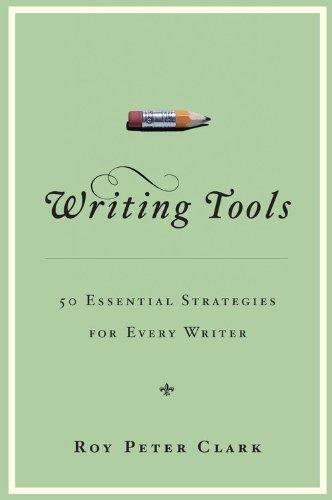 Appropriately named for the SWET Toolbox column, Writing Tools: 50 Essential Strategies for Every Writer is a series of short pieces on becoming a better wordsmith from pepping up sentences to forming habits that will pay off in the longer term. Although some examples are taken from fiction, the book appears more obviously useful to writers of nonfiction. It begins at the micro level in a section called “Nuts and Bolts.” This is the most immediately practical part of the book, as Clark spells out how word choices and sentence structure can have positive or negative effects. It got me thinking about ordering sentence content in particular, and areas to focus on when revising work. Some of the material is familiar—warnings against excess use of the passive and adverbs—but Clark balances his advice with examples of when these techniques can work rather than insisting on unhelpful blanket statements. Once the basics are in place, the second section, “Special Effects,” focuses on additional skills to help writers go the extra mile. One of the practical pleasures of reading a book like this is new vocabulary for talking about the craft. In this section, Clark presents his idea of “word territory” when discussing how distinctive words should not appear too near each other (unless intentionally). He also introduces the term “ladder of abstraction,” for describing how writers climb up and down from concrete terms like “bloody knives and rosary beads” to “words that reach for a higher meaning,” such as freedom and literacy. Larger structures come into play in the third section, “Blueprints.” It covers planning and arrangement of complete pieces, offering, for example, a string of suggestions for working towards endings, such as closing the circle, tying back to a memorable element, or giving an apt quotation. The final section, “Useful Habits,” gives ideas on topics like getting over writer’s block, reading in different ways, and building up to a longer project. Clark says up front in the introduction that he is providing tools not rules, and that a lot of good writing violates his general advice. The whole book is refreshingly non-didactic. It was easy to disagree with occasional suggestions without feeling this tainted my appreciation of the rest of the material. The 50 chapters are short, yet seem packed with clear recommendations and examples. And although they are self-contained—the book originated as a series of online articles—the transition through the different sections provides a strong overall structure. I don’t remember any formal education on being a better writer since my mid-teens, so “Nuts and Bolts” was particularly welcome in setting out some often half-learned lessons. Many of the later pieces have inspired me to consider other aspects of the craft. I’m sure I will be dipping back in from time to time for further insight.